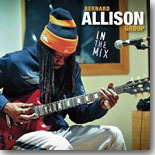 In the Mix (Jazzhaus Records) is Bernard Allison’s first studio effort in six years, and marks a change of pace. Allison backs off a bit from the screaming guitars that usually are a part of his repertoire and focuses more on the songs and grooves this time around. While there’s always been a funk/R&B/soul backdrop to Allison’s music, it’s more front and center with this new release, which consists of ten tracks, evenly split between originals and covers. The rousing shuffle “Something’s Wrong,” another original, features some tasty slide guitar work from Allison (who thanks the late Johnny Winter in the liner notes for teaching him his slide technique), and “Lust For You,” co-written by Allison and Lonnie Baker Brooks, seems to have its roots in Brooks’ father Lonnie’s native Louisiana, with moody B3 from Mark “Muggie” Leach and one of Allison’s most distinctive guitar solos. Allison’s take on the Tyrone Davis soul classic, “I Had It All The Time,” leans more toward the blues….I really like the funky rhythm and his guitar work on this one. Allison also covers the great Freddie King’s “I’d Rather Be Blind,” reworking it by taking a slower pace than King’s original, with Leach’s B3 working effectively in tandem with Allison’s piercing leads. The original funky blues “Set Me Free” finds Allison pleading for independence. The final track is a cover, one of my favorite Luther Allison tracks, “Moving On Up,” and Bernard does a terrific job with it. The secret weapon on In the Mix is the tight, TIGHT rhythm section of Leach, George Moye (bass), and Mario Dawson (drums). These three rise to the occasion at every opportunity. While Allison’s guitar work is not as “outfront” as on previous releases, he seems more comfortable and relaxed, content to just take his time and let these tracks just simmer and percolate. The result speak for themselves. This his finest release yet, and one of my favorites of 2015 so far.